Aaaaaaaah! isn’t one of those potentially crowd-pleasing cult movies that just needs to reach a wider audience. Instead, it’s one of those totally wacko cult movies and I, for one, just couldn’t cope . . .
Part of me thinks there’s nothing really worth explaining, but I’ll give it my best shot. 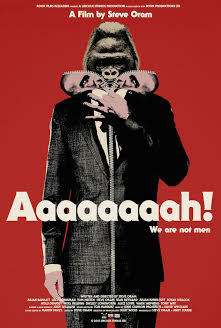 In Aaaaaaaah!, all of the actors are playing human apes. So, they look like humans and live in human houses, but they act and sound like monkeys. The closest the film gets to recognisable speech is a couple of ‘yes’-like grunts that sound kind of like a disgruntled Frenchman’s ‘oui’. And, talking of ‘oui’, there’s a whole host of bodily fluids on display here, spewing every which way but loose. Steve Oram (writer-director and star, whom you may recognise from Ben Wheatley’s caravan massacre movie, Sightseers) captures these creatures’ depraved lifestyles in scatological detail. Now, he may well argue that this is all a gross satire for 21st century life. But that just doesn’t sell when everything is smeared with excrement, and the whole thing starts to get really tiring, even at a slim 79 minutes. But props to the actors for giving it there all, even when they’re caked in their own vomit. There are a couple of familiar faces in here, but most of the cast were new to me. Which only goes to heighten the distinctly British strain of Lynchian weirdness. I mean, you know it’s really out-there when Noel Fielding is the least strange thing about it. There’s nothing sane about Aaaaaaaah! and while that may sound appealing at first, don’t get too far ahead of yourselves. Aaaaaaaah! is out now on DVD/VOD via FrightFest Presents. ← Night of the Living Deb Review – Great Fun!